Got your radio on? The scorpions are coming soon! And the dragon with them! Right after the NWO takes a hit! It's the next benchmark in Bible prophecy! You are there! and what these verses mean, let's make sure we SEE the PICTURE. There's a great beast, a ghastly monster if you will, who rises up out of the sea. And he has seven heads! I don't know of any real animal or beast who has seven heads, do you? He also looks like a leopard with bear's feet and lion's mouth. He's an awesome, terrible looking thing. In fact he makes Godzilla look like a beauty contestant. Then you have just seen the awesomeness of what the structure of the New World Order will look like after Satan, the dragon, is cast out of heaven and takes over. he was cast out into the earth, and his angels were cast out with him." Now let's look at the symbolism used in the PICTURE. 1.) Who is the dragon? We just read Rev. 12:9 so there can be no doubts or guess work as to the identity of the dragon. The Dragon is Satan. except that he will have 3 more "crowns" with him this time when he gets here. 2.) And what is the sea? The sea is the people of the earth from which the political system arises. Rev. 17:15 And he saith unto me, The waters which thou sawest, where the whore sitteth, are peoples, and multitudes, and nations, and tongues. 3.) And what or who are the ten horns? We've seen them before and we'll see them again. They are ten kings under the authority of Satan! during that great hour of temptation. Are the ten kings ten leaders of countries today? they will most likely accompany Satan as part of that entourage of angels who are cast out with him. because they possess all the characteristics’ of a scorpion! and how they take their prey. Luke 10:18 "And He said unto them, "I beheld Satan as lightning fall from heaven." This now is a new subject that Jesus is teaching us. This is Jesus speaking to His followers and it is prophetic, and refers back to the time of the garden of Eden, and Satan's fall from the first earth age. It also applies to Revelation 12: 7-9, when when Michael will cast Satan out onto the earth, and his fallen angels will come with him. So in the word "fall" indicates that Satan will be here in person because he was kicked out of heaven, and not on his own accord. The plan is set in motion, and it will take place exactly as it is written. Satan came in the first place as a deceiver, to destroy the seed line that the Christ would come through. The second time he will come as the false Messiah, to deceive all the people of the earth. It will happen exactly as it was prophesied. In the Greek text, it is "Behold I have given you the power..." The enemy is Satan, the one that will "fall as lightning from heaven onto the earth". The serpents are the Kenites, the children of Satan, through his son Cain from the garden of Eden. 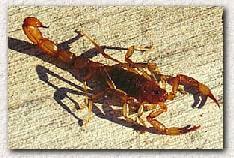 The Scorpions are the fallen angels, that will be booted out of heaven on to the earth right along with Satan. Revelation 12:9 "And the great dragon was cast out, that old serpent, called the Devil and Satan, which deceiveth the whole world: he was cast out into the earth, and his angels were cast out with him." This next time takes place at the sixth trump, and we will see these fallen angels of Satan here on earth in our generation. There hasn't been one soul or spirit that has died yet, for that time of death comes at the end of judgment day. Satan is not after your physical body, but your soul and spirit, and he will try to deceive you, or buy it at his price. What is your soul worth? Is there a price that you would sell out to Satan? It is time to wake up spiritually, and open our eyes and ears to the truth. Stop and think on this: Satan's power and that of his angels are limited. in Revelation 9:4 we see that it goes; "...only to those men which have not the seal of God in their foreheads." If you have studied the Word and know the truths that we will face from Satan, there is no fear or deception that can sway you. So notice first that those with the seal of the truth in their mind from verse four are not affected by Satan and his realm, and the sealing must be prior to the coming of Satan. The truth in a person's mind of the Word is the the protective barrier from the poison of that scorpion Satan's deceptions. Once Satan has arrived, then God turns, or gives the men, women and children, who do not have the seal of God in their forhead/mind, over to Satan, and this torment comes upon them. Their ignorance of the truth from the Word is their protective barrier, for this act of following Satan in ignorance, not knowing who Satan is, will allow them the right for the teaching and instruction of the Millennium age of Christ's kingdom here on earth. So why can't they get the word at that late time when Satan is on earth? Amos 8:11 tells us that; "Behold, the days come, saith the Lord God, that I will send a famine in the land, not a famine of bread , nor a thirst for water, but of hearing the words of the Lord." The Spirit of our heavenly Father Himself will close their minds to the truth, and turn them over to Satan. Now back to our study. They will reign over, i.e. divide up, the whole world, all seven continents. 4.) And what of these names of blasphemy? Don't forget, just as Satan will be appearing as the Messiah, though he be the false one, his angels will be with him and appearing as, and called by the name, "Ministers of Christ". Can you be more blasphemous than that? 5.) And what about the leopard, bear, and lion? 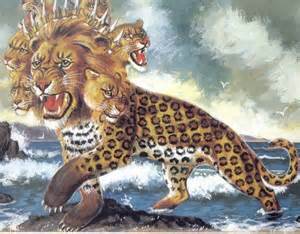 We have learned about the attributes of these three "beasts" before, and their usage in the Bible. You should read all of Daniel chapter 7 where you will find the leopard, the bear, and the lion all identified as separate beasts before the final beast with ten horns rises up and takes over. The leopard is cunning and swift whose spots cannot be changed (Jer. 13:23). the Song of Moses, which we will soon see the overcomers singing in Rev. 15. His powerful feet are able to crush and break in pieces as the one world system can do. And mouth of a lion? The mouth contains the lion's teeth which rip and shred and tear and devour. Remember we read of Satan's "locust army" who also had the teeth of lions? Rev. 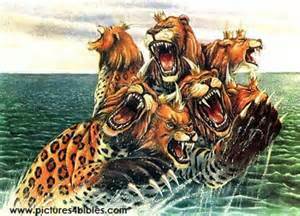 9:8 And they had hair as the hair of women, and their teeth were as the teeth of lions. But there's no need to fear these attributes of Satan's political system. or scorpions, or locusts, etc. We have power over them (Luke 10:19) . Did the lion's mouths hurt Daniel when he was cast before them in the den? Not! Even Paul was delivered out of the mouth of the lion by the Lord who stood with him! 2 Tim. 4:17 Notwithstanding the Lord stood with me, and strengthened me; that by me the preaching might be fully known, and that all the Gentiles might hear: and I was delivered out of the mouth of the lion. So much for lions and tigers and bears, oh my! Rev. 13:3 And I saw one of his heads as it were wounded to death; and his deadly wound was healed: and all the world wondered after the beast. Hmmmm. Would seem that the New World Order has a problem keeping its heads on straight. One of them takes a lethal blow to the skull. But not to worry, his deadly wound is all patched up. There, there. Any guesses as to who heals it? Note: I thought I told you not to guess about God's Word. the supernatural archangel coming as Jesus Christ, heals the deadly wound. No problem for Slick Satan! "And all the world WONDERED after the beast". Yes, it will be truly amazing, just marvelous for world peace! (he also gave us the Federal Reserve System). The following quotation is from the World Book Encyclopedia. "The League of Nations was an international association of countries which was created at the end of World War I. It grew out of the desire of the people throughout the world to prevent war forever. The most important work of the League of Nations was the peaceful settlement of international quarrels. The Council of the League of Nations was set up for this purpose. Unfortunately, the efforts of the Council were not always successful. For example, during 1935 and 1936 the Council failed to settle the dispute between Italy and Ethiopia. At that time Italy was trying to build up a great empire at the expense of the Ethiopians. The failure of the Council to solve the Italian-Ethiopian dispute did much to weaken and finally destroy the influence of the League of Nations. No one really had the power to force nations to remain at peace." World Book Encyclopedia, 1953, vol. 10, pg. 4342.
for it could not settle an international dispute. that could try to force nations to remain at peace. How is it going in the Middle East these days? Everyone should be totally "up to speed" by now on who this dragon dude is. Why is it that the world worships the dragon? They believe he is Jesus Christ! So of course they will worship him! and does bring about world peace and a One World Political System. And who is able to make war with him? My goodness, they say that now! "Who is able to go against the wishes of the international community?" How much more true it will be when Satan comes poising as Christ! Turn on your radios and television sets and listen to what is being said. Then go read 1 Thessalonians chapter 5. No one, not even the apostle Paul, should have to tell you what season we're in! 1 Thes. 5:1-3 But of the times and the seasons, brethren, ye have no need that I write unto you. Should not have to tell you this! That means while one is sleeping. The locusts are coming soon! And the dragon with them! Right after the NWO takes a hit! It's the next benchmark in Bible prophecy! They're crying Peace and Safety! The cold war is over and people no longer fear. Editors Note: We Americans continue to prove "that" to the world. These days we always chose money (our financial well being) over defeating terrorists. Watch and be sober! They're crying Peace and Safety! The cold war is over and people no longer fear. Isn't studying God's Word in these last days exciting? I mean here we are, present when these prophecies are coming to pass! Just think! The prophets like Ezekiel and Daniel and all the disciples of Christ wanted to know what it would be like in our day, in the final generation, the generation of the fig tree which was planted in 1948, the first born of whom are now senior citizens and received AARP cards in their right hands (No, it's not the mark of the beast! It's just a sign of aging and the advent of discounts.)! Do you realize how blessed we are that our Father saved you and me to be born now, at the end of the 6th day, the 6,000 years of flesh man, to witness the birth of a new age? Do you realize how exciting things will be shortly? We get to face the Dragon (Satan) and his locust army!